in the deep peace of the North Norfolk countryside, at Harnsers End, Oulton near Aylsham. Through meditations, mantra and visualization, enter the watery world of imagination, emotions and self-image. 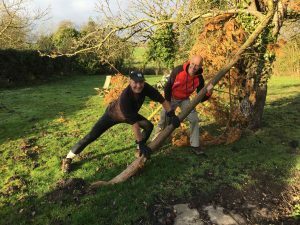 Yoga Lightness invites you to join their retreat in rural North Norfolk. 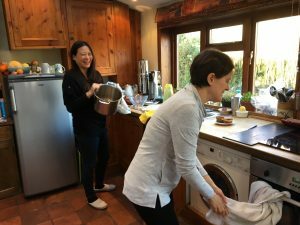 If you’re looking for a quiet place in the country to retreat to over the Christmas period with yoga, meditation, reflection, satsang, a workshop to help you define your direction for the coming year, country walks, and warm comfortable bedrooms in a cozy house with stunning country views, this retreat is designed for you. The numbers are small and are limited to make this a unique and personalized retreat. There will be no Christmas carols, decorations, presents or turkey. In fact, none of the trimmings! 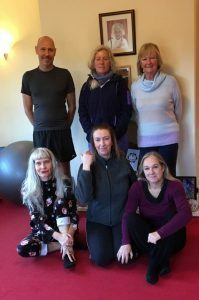 The small group (six in total including the instructor) was a good size, sufficient company yet small enough to feel welcomed and part of the group. 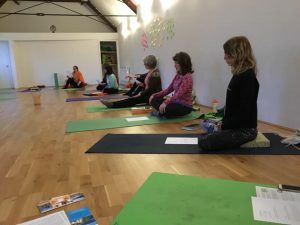 I’ve come away with some useful insights because of the reflections we were able to do within yoga and the questions which Jane guided us to think about. 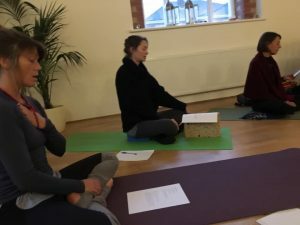 Kundalini system, chanting, satsang and hidden yoga are all new aspects to me and I came with an open mind to the whole programme and have learnt a lot more than I anticipated. 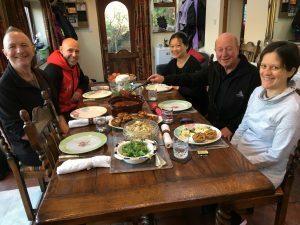 Whilst I am not a vegetarian, I thoroughly enjoyed the vegetarian food which Jane cooked – it was very tasty and the variety of food over the 4-5 days was wonderful. I stayed in the ‘snug’ which had a double sofa bed, and I also benefited from having sofas in the room (its normally the sittting room!) all to myself!! The room was comfortable and the rate was cheaper than a bedroom, and good value for money. The surrounding area of Norfolk is beautiful and Jane took us on optional woodland walks and also a beach walk (15 minutes drive away) during our afternoons. We also built a fire in the garden for the evening twice which was a wonderful way to end the day. 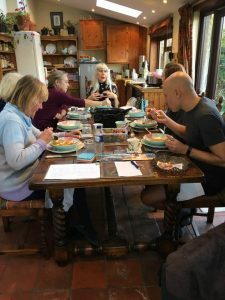 Jane is a superb instructor and host and goes out of her way to make you feel welcome and to help you get the most from your time spent with her on the retreat. 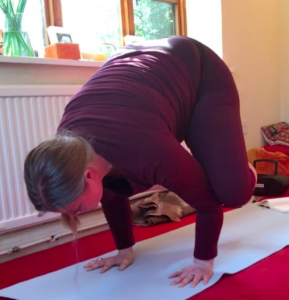 Going beyond stretch and relax with this meditative style of Hatha Yoga respects the body as a spiritual tool, leading to greater peace of body, mind and heart. The Kundalini System can be said to be a map for your life’s journey. Start with feet placed firmly on the ground. June 9th 2018. 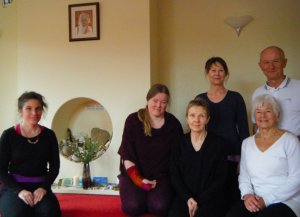 Hatha Yoga and Relaxation followed by shared lunch and an afternoon exploring the First Cakra of the Kundalini System. 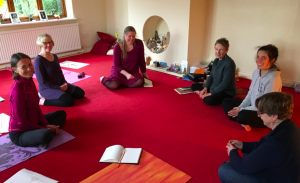 April 21st 2018 Introduction to The Kundalini System Day Retreat . 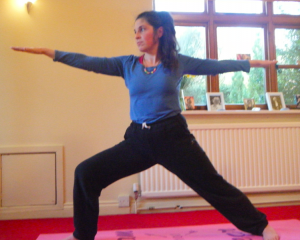 Hatha Yoga and Relaxation Workshop, Retreat weekend, November 10-12th 17. 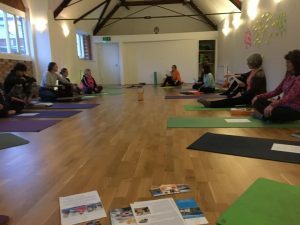 ” A lovely relaxing class. I felt safe and contained in this environment”. “Excellent workshop. Was able to reach new understanding on my dream”. “There is a natural order of things. What hasn’t been expressed will be expressed. Keeping the unconscious ‘down’ is tiring. Surrender to the process”. 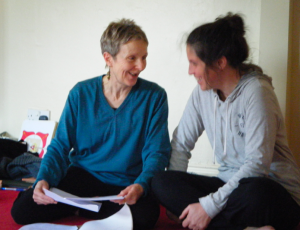 “Jane is a fine teacher and very confident and comfortable with the method”. Elizabeth Taylor. Teachers from France, the Netherlands and Kent in England gathered in Oulton. Hosted by Jane and facilitated by Swami Sukhananda. Click here to read about it in the local news.